Powered by the preferred MerCruiser 6.2 MPI stern drive Barbados IV is a wonderful example of the Bayliner 2855. She has a comfortable cruise speed of 18-21 Knots and will sprint to 30 Knots when asked. The layout is perfect for families to enjoy a day onboard or a week at Rottnest. 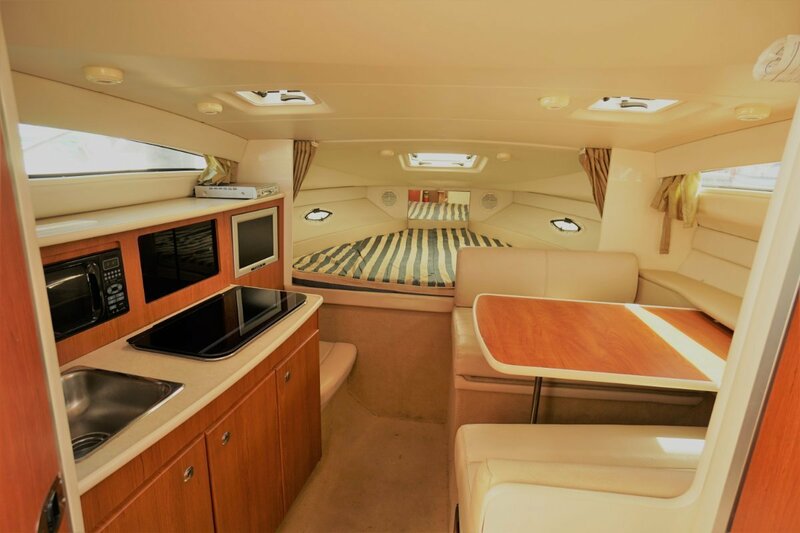 She has two very generous double berths plus a convertible dinette, giving a sleeping capacity for 6. Barbados IV features a very large bathroom to starboard with toilet, basin and stand up hot/cold shower ( yes ladies you can stand up and wash your hair properly without contorting like a pretzel). There is good storage for toiletries and loads of elbow and shoulder room. The vessel has a 200Lt water tank and 40Lt hot water service, which is plenty for a family for a weekend of showers, cooking etc. The owner's cabin to port and under the bridge has plenty of light and ventilation, and curtains to allow a sleep in. The double berth is large, comfortable and spacious. There is plenty of storage and the cabin has a door for privacy. Forward to port is the galley featuring a microwave, 50Lt refrigerator, sink, plenty of bench space for meal/ nibbles/ cocktail preparation. There is a television and video onboard, however if your kids are like mine, they'll just use their tablets anyway. Opposite the galley is the dinette that converts to another double berth should guests stay aboard. Under each side of the dinette are large storage spaces. Up the very front is an enormous double berth. It's huge and under it yet more storage. Throughout the boat there are numerous windows and opening deck hatches portholes giving a light, spacious, airy feel. She is very easy to manoeuvre and spacious above and below deck. The 2855 is stable without being too big to find her way through an anchorage on a busy summer weekend and can slip through shallow passages in the bay with the drive up. Barbados IV is no lightweight at sea either. She features Bayliner's proven deep v hull shape and enough displacement and power to provide a comfortable, safe passage when the weather is far less than perfect. Everything is well thought out and well built. There are handrails wherever you put your hands. Access to the foredeck is via moulded non-slip steps and through the centre section of the windscreen making the passage forward to the bow safe and easy. The cockpit has built in lounges and a table for alfresco dinning, sheltered from the sun and wind and the engine is situated under the cockpit floor in the engine room. Aft of the cockpit is the moulded non-slip boarding platform, with weaver brackets for mounting the inflatable and integrated stowaway ladder. She is economical to own and run and I must say, I really enjoyed the time I spent onboard for the listing and photo shoot. I would happily own her myself. and at $69,000 great value for money. The ability to stay overnight makes Barbados IV your own waterside luxury apartment at your disposal whenever you feel the need to get away. Call Matt Pearce on 0488 026 244 to see why this boat won't last long. * Terms & conditions apply. Subject to approvals. Applicant's credit score may affect repayment. Full sized galley, plenty of storage, sink, hot/cold fawcett, loads of bench space. Full cover and clears, new front clears recently. Sunshade covers to bridge, curtains throughout. To standard, life jackets, flares, epirb, standard carbon monoxide dectectors interlocked with engine control harness. 27 mhz radio, 240 VAC outlets through boat, Australian delivered 240 VAC shorepower, Microwave, 12DC/240VAC refrigerator to galley, house and start batteries with Isolation switchgear. Full 12/240 circuit breaker panel in master stateroom. Barbados IV is a wonderful example of the Bayliner 2855. She is spacious, stable, sea worthy and very comfortable while being economical to own and run. Perfect for a family day out, weekend or week at Rotto. * Terms, condition and approvals apply. Sea Renity Marine offers new and used boat sales as well as a brokerage service. Contact us today to see how we can help you.